Oh gawd I love this deck…!! 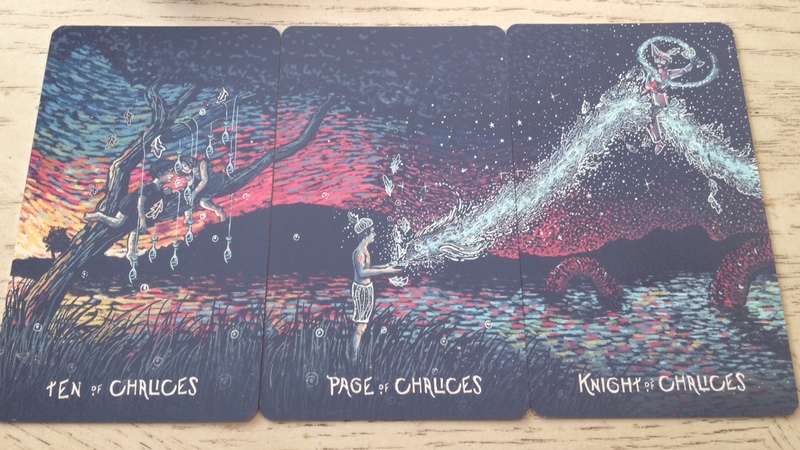 When I first saw the Prisma Visions tarot by James R. Eads, I knew I wanted it. Then after I learned more about it, the continuing narrative of the Minor Arcana cards forming four long, exquisite landscapes, and the bold symbolist-surrealist imagery in the Major Arcana, I knew I had to have it. I love the bordered Majors juxtaposed with the borderless Minors (shown later). Eads’ art here is a contemporary tribute to French Impressionism and Post-Impressionism, calling to mind Monet, Renoir, Van Gogh, and even some Degas. You can view all the images on the Prisma Visions website, here, though I’ll provide some samples in this review. I love the flip top box and pretty much the design for every part of this deck and its packaging. 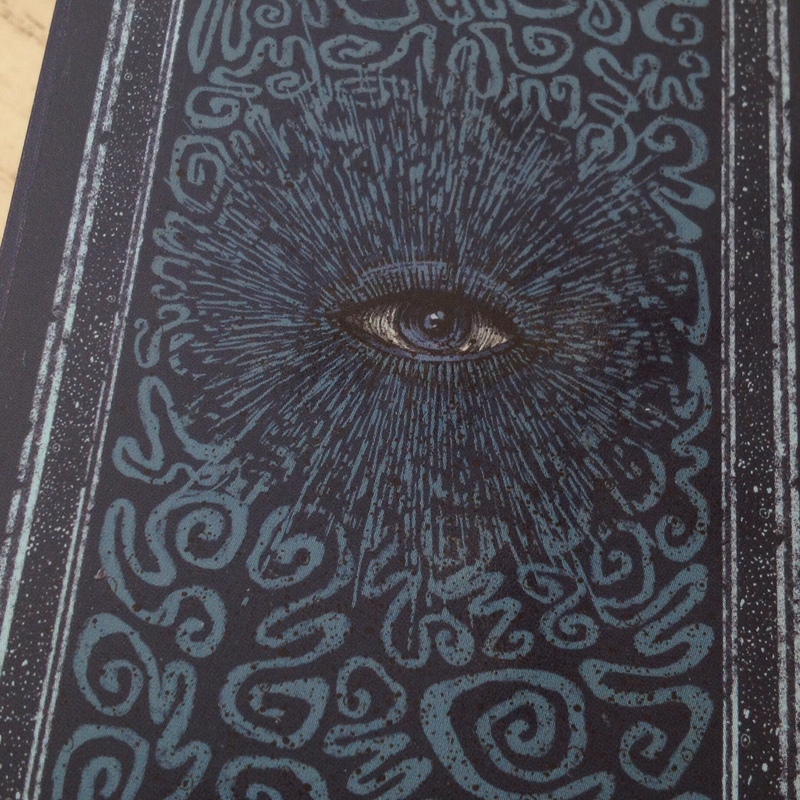 You have a modernized all-seeing eye on the card backs, and while the card backs are not reversible, I still read with reversals when using this deck. The gilded silver edges are an exquisite detail. 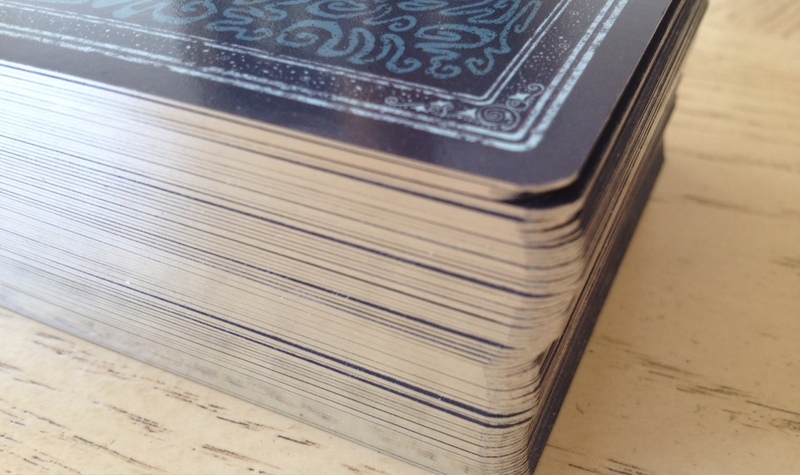 You’ve got a thick, heavy, and durable cardstock here, so the cards are thicker than traditionally published tarot decks. I do love the thicker cardstock. There is a semi-gloss finish to the cards. It’s not the full on glossy of, say, typical Hay House oracle decks, and it isn’t the papery matte finish that I tend to prefer. You’ve got the RWS numbering of Key 8 for Strength and Key 11 for Justice. Many of the images on the cards pay homage to Rider-Waite-Smith symbolism, but Eads definitely adds his own personal interpretive twist. And I love that. I love The Hermit card, The Devil card, and The Tower. I’m not a big fan of that Temperance, though. I am intrigued by Eads’ interpretation of Justice. Here you see a snake that has bitten the hand, and in vengeance, the hand slices the snake in two, symbolizing cause and effect. It’s definitely a different take on the concept and idea of justice than the balancing scales. Being a Libra myself, I like to see justice as balancing scales, if that makes me fluffy at all, and not so much the vengefulness of this Key XI. In a reading with the Prisma Visions, I would read the Justice card differently from how I might read it when using a deck that stuck closer to the original imagery of the RWS. That said, I really love how Eads adds his personal views into the cards. 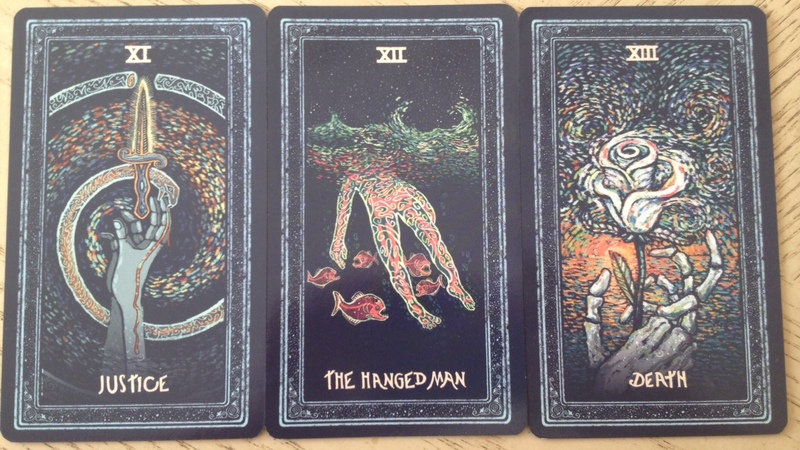 I’m loving The Hanged Man, where a figure is floating in water, face up to the stars, serene, even while piranhas nip at the flesh of his feet. Here, The Star card is a continuation of the narrative started in The Tower. After the fall of the tower, a woman is cast into the air, but she is now ascending in The Star, not falling, and in her ascent, she has a more panoramic, complete view of the world below her, in other words, a clearer and more complete perspective of her situation. I love that about the Prisma Visions Star card. Finally, I love the symbolism and surrealism of The World card. On the Prisma Visions website, the Minor suits as a whole are each titled. 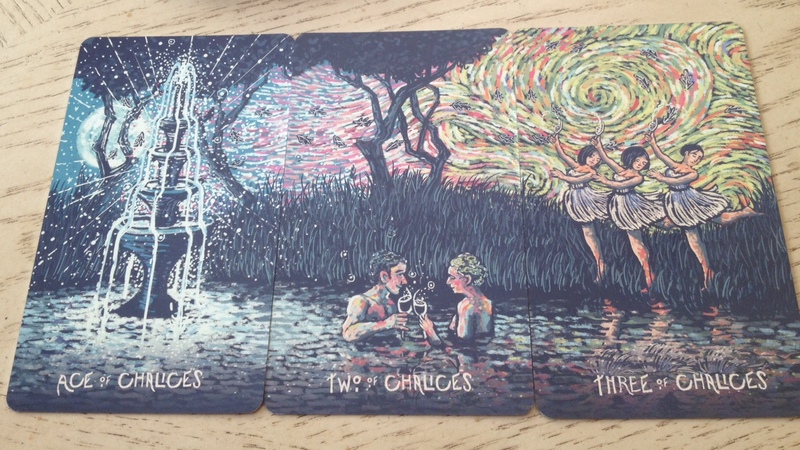 Check out the beautiful complete landscapes the cards of each suit forms. I couldn’t figure out how to show it to you with my camera phone, but they are all on the Eads’ website, so definitely check it out. You can even by limited edition art prints, which I’m definitely contemplating right now. The surrealist-abstract-impressionist art in the Wands court are beautiful to me, and I love it, though I can see that they might not be for everyone. 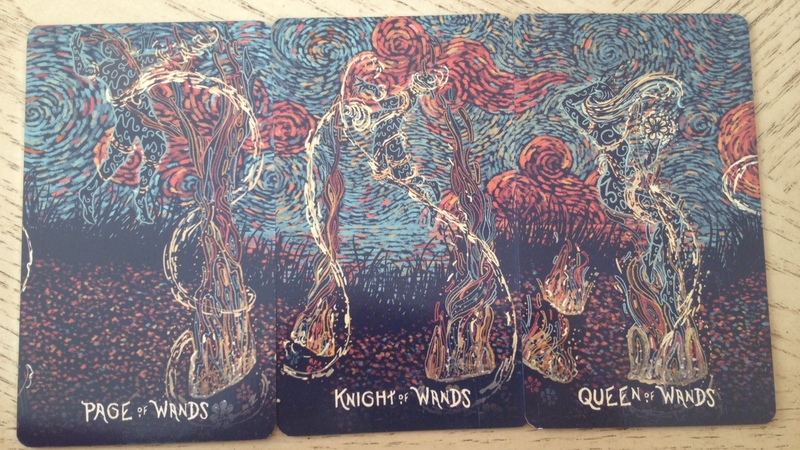 The Prisma Visions tarot courts seem better fit for figurative interpretations of the courts than literal (i.e., representing actual people in a seeker’s life), at least that’s how I personally approach reading with the Prisma Visions. The seasonal attributions that Eads uses differ from my own, which is fine. We all use what makes sense to our own personal ideologies. 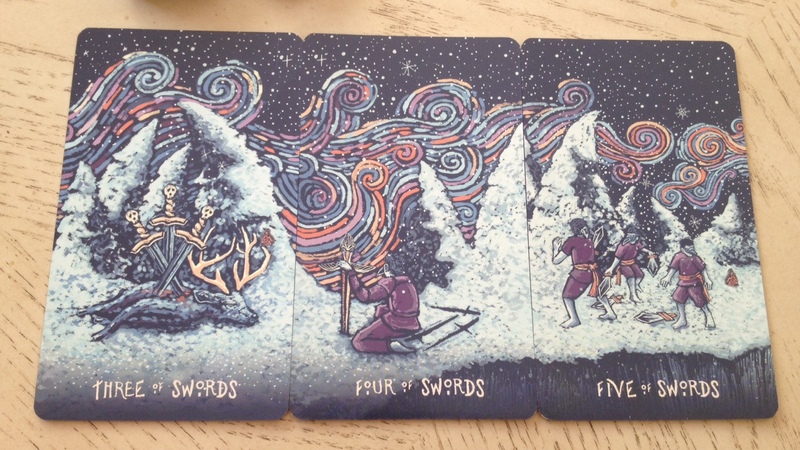 In the Prisma Visions tarot, while Wands is spring (same for me, too), Cups is fall (for me, it’s summer), Swords is winter (autumn, for me), and Pentacles is summer (winter, for me). 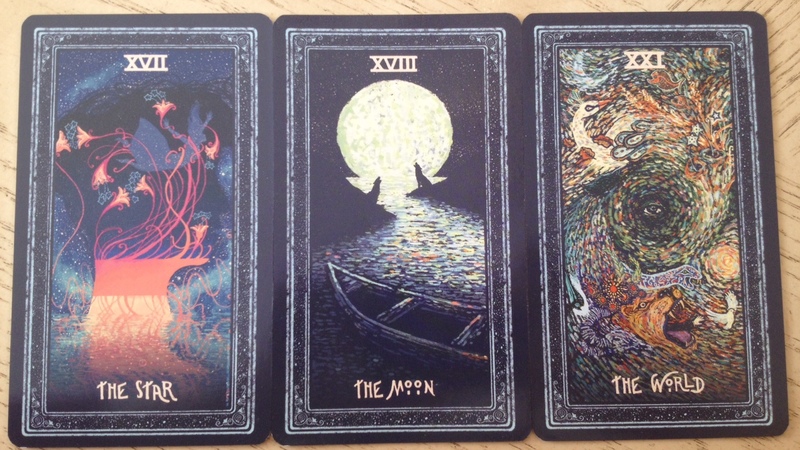 However, the seasons are well depicted in the Prisma Visions, so when using this deck, I do follow Eads’s attributions. Above in the Chalices or Cups, for example, the colors vibrantly remind me of autumn. In the Swords below, the season of winter is clear to me. Eads does interpret the suit of Swords differently from me. 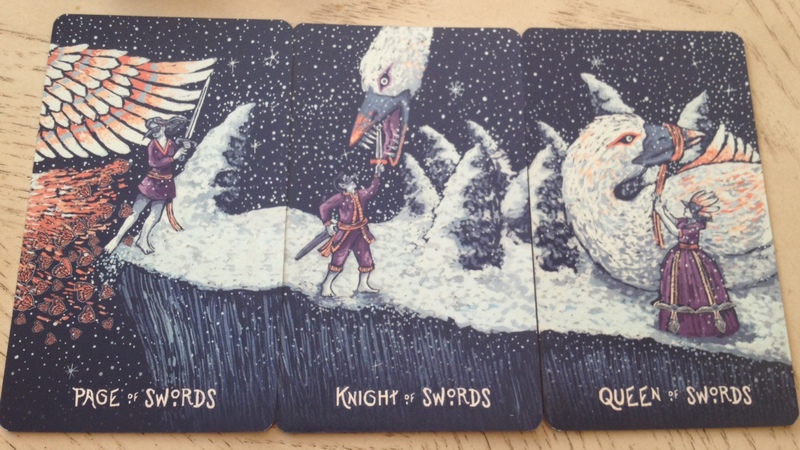 There is an air of malice and foul play around many of the Swords cards in this deck, whereas for me, and I know those attributes are in the suit of Swords generally, almost universally for folks, but since I identify so strongly with the suit of Swords, of course I like to give it a more positive spin. I do love his approach to the Queen of Swords (my signifier). She is in a decided pursuit for justice, even if it means bringing down that beast, another sentient being, and there is a coldness and detachment to the way she dispenses justice. She gets the job done, with little regard to the emotional consequences. I also love how the Page of Swords is indecisive, yet swinging her swords around valiantly while she is backed to the edge of the cliff. I think art wise, the suit of Pentacles is my favorite from the Prisma Visions tarot. I love that Ace of Pentacles, and love the warm color palette Eads used throughout this suit. 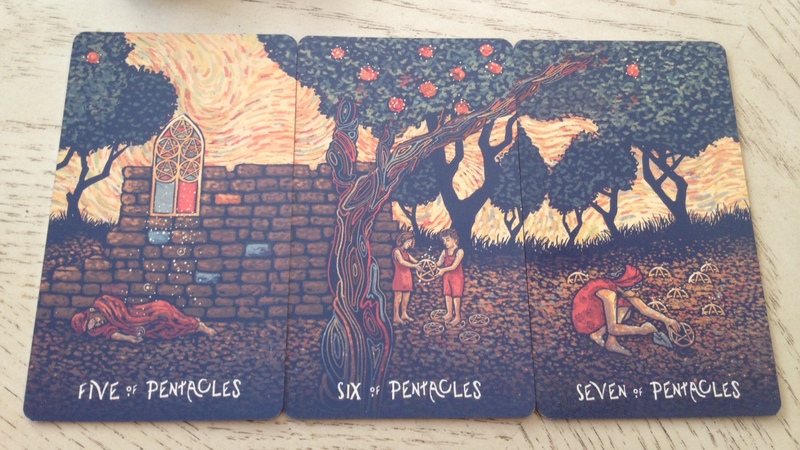 I was curious, given that Pentacles are now summer, how Eads might interpret the otherwise traditionally wintery Five of Pentacles. Here he has done it magnificently. It’s a card of hitting rock bottom because you’ve mismanaged your resources. I love how the themes of abundance and sharing are depicted in the Six of Pentacles. The Pentacles court is my favorite in terms of art. 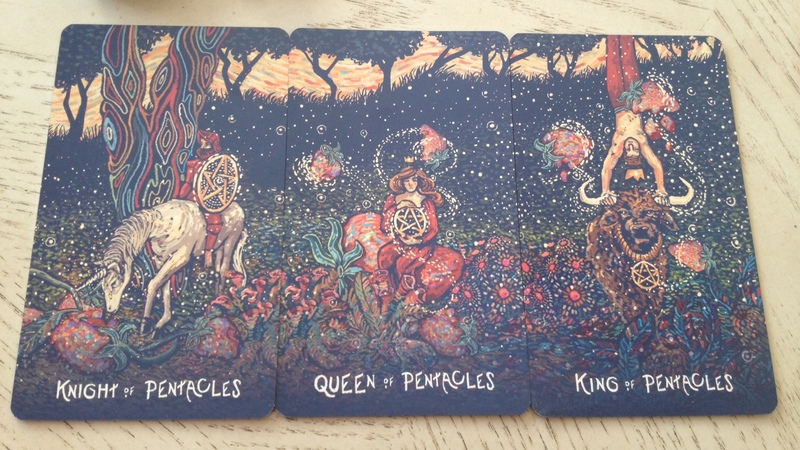 What a lovely Queen of Pentacles there. I also love Eads’ interpretation of the King of Pentacles, a lot more adventurous and dauntless than I might normally give the King of Pentacles credit for. Oh, and did I mention yet that this tarot deck has 79 cards? 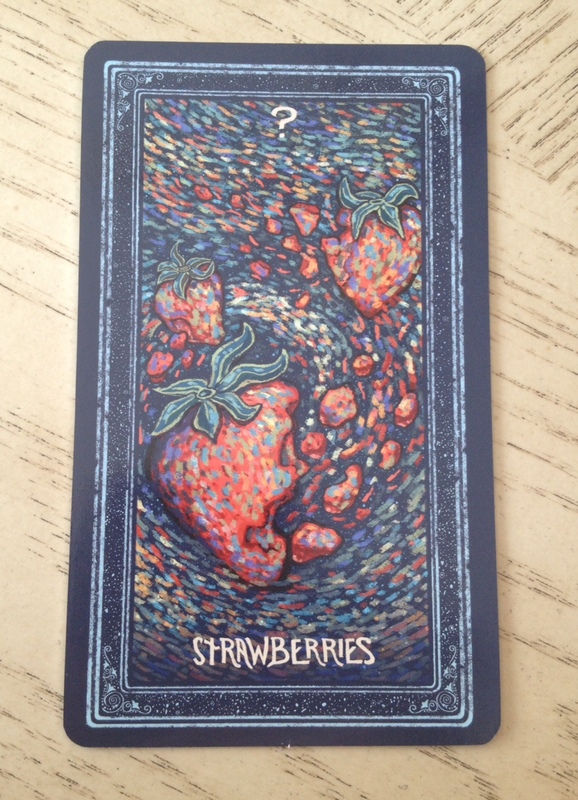 I love the addition of the Strawberries card, with the question mark. What is the Strawberries card, you ask? I guess when it appears in a reading, it’s a burst of vital energy into the reading, a current of power. “Some facet of your life is anointed right now,” says the guidebook. 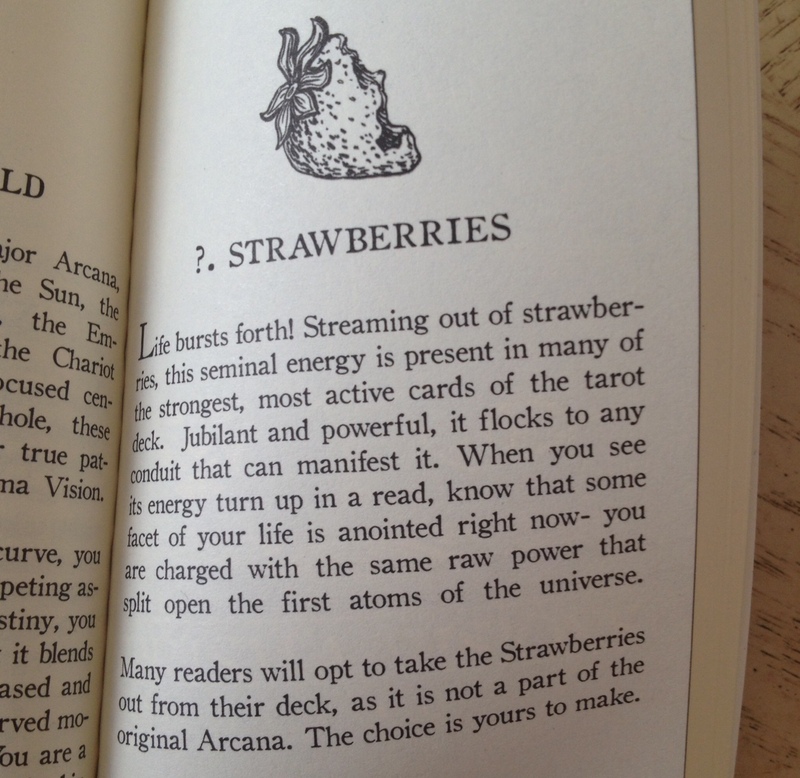 I am definitely reading this deck with the Strawberries card included. I found the deck easy to read with and pretty accurate. The guidebook comes with instructions for a 3-card spread, 5-card cross spread, and the Celtic Cross. Here I’m doing my own thing, cutting the deck into four piles and reading the top-most card to get a general sense of the energies in the four quadrants of life corresponding with IHVH. 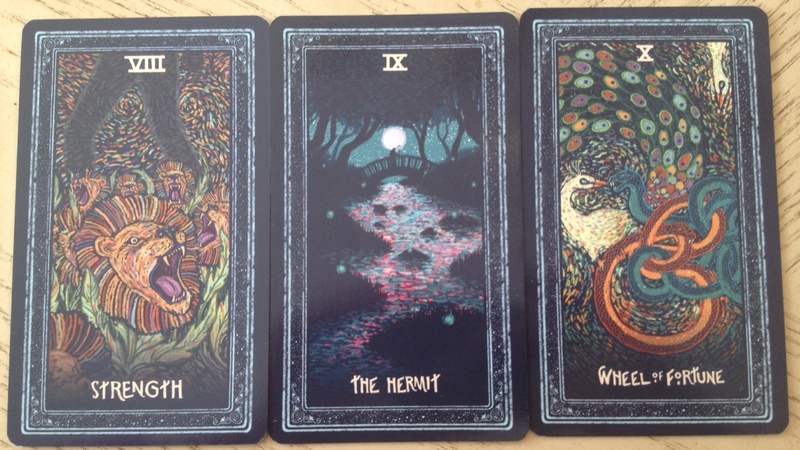 I found the above four cards that turned up to be a comprehensive assessment of what’s going on with me these days. The Prisma Visions Tarot is easily one of my contemporary favorites. I do see this deck going up in value as a collector’s deck in the future, so it would be worth it to pick up a copy from the first print run. 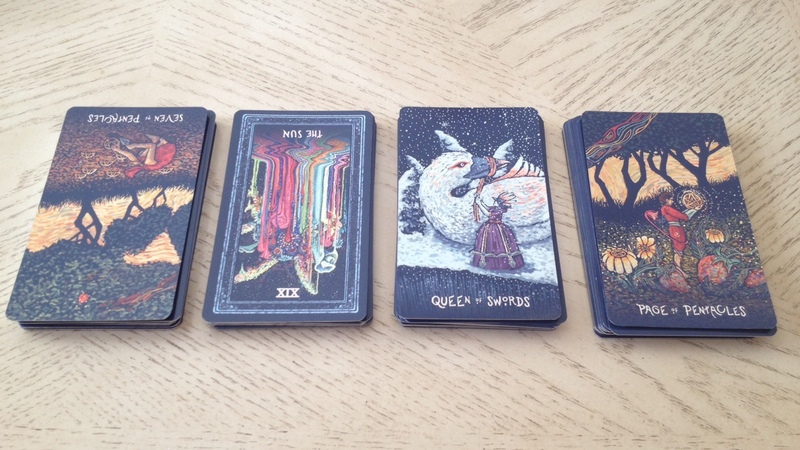 Eads did a fantastic job with this tarot deck and I am thoroughly impressed. Bravo. I love this deck. It’s such a beautiful deck! I’m unspeakably jealous. Thank you so much for sharing it with us. Benebelle, a great, thorough review, as always! You said the Court cards may be better fit for figurative interpretations rather than literal. I think I may take that challenge and get the deck to test it out. I’m wondering if the colors and lines in the images actually become more literal with use and familiarity. I do like the Courts, especially the Queen of Pentacles and Queen of Swords (my signifier too). The first embraces all, and the Queen of Swords controls the debate and settles the argument! Outstanding !! The Deck & Your Review. I haven’t had the time to spend YET, but with your review as a prod and a prompt, I will. 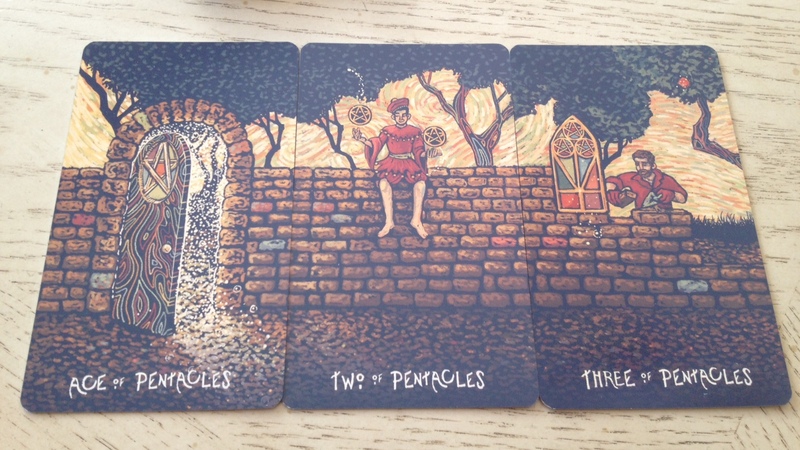 I have two (2) of these decks, and one sits, silently, so far in my bookcase…….Thanks, Benebel for all you do to make Tarot the adventure it is. I’ve even deactivated my Facebook account for the summer, as a very unnecessary distraction, so that I can concentrate on my Tarot and your website. 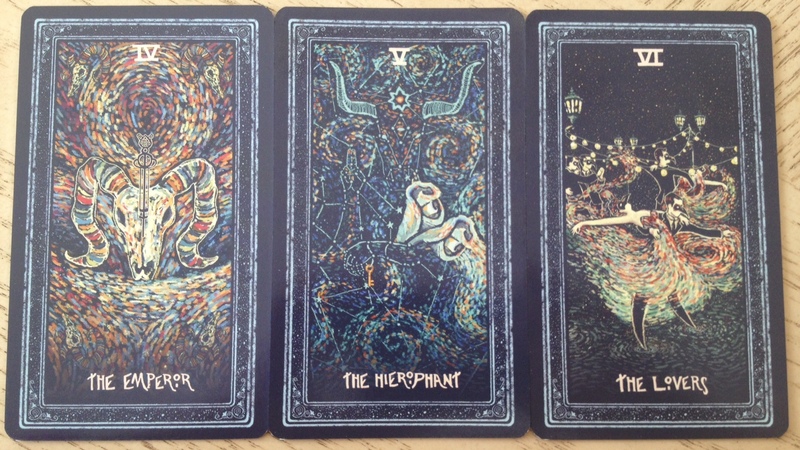 So actually… I haven’t really been using this deck for reading or divination. 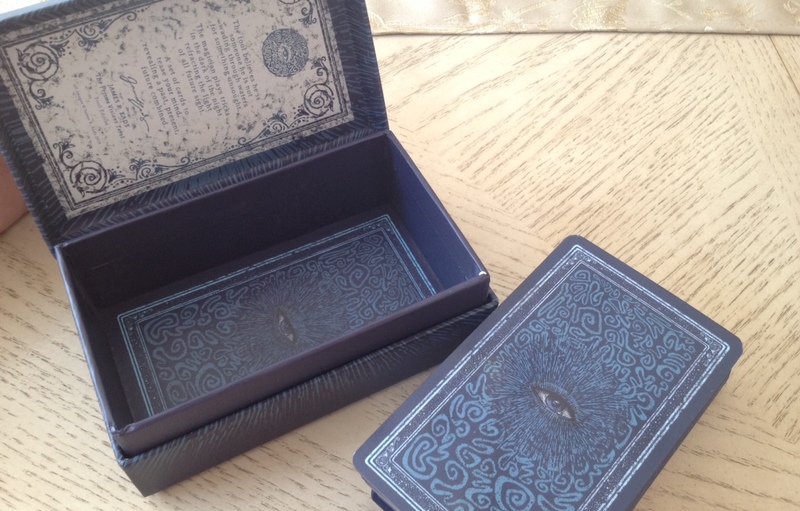 I have to say, I really more just go through it and go “ooh.. ahh…” I did read with it a few times when I first got the deck and nothing out of the ordinary. It read well. I just don’t use it for reading, for some reason. 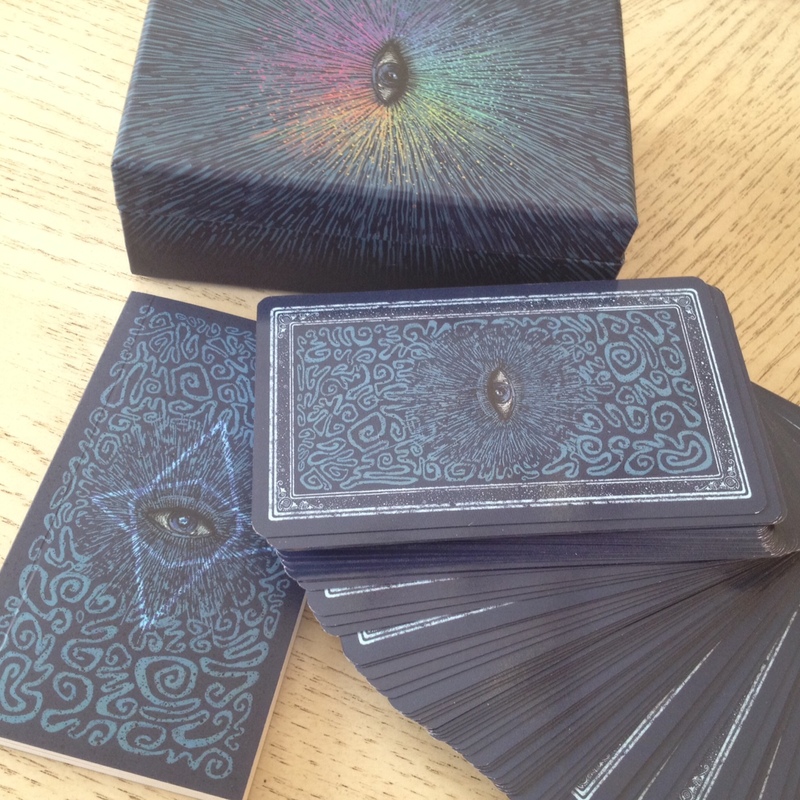 It’s such a beautiful deck, though, and incredibly well made. Tried it out with a client, it reads well. Still working on my relationship with it though. Been making notes for a couple of weeks; the more I fish them out, the more interesting and multifaceted they get. Agreed on many points here – Temperance is just okay, not absolutely in love with it at all. 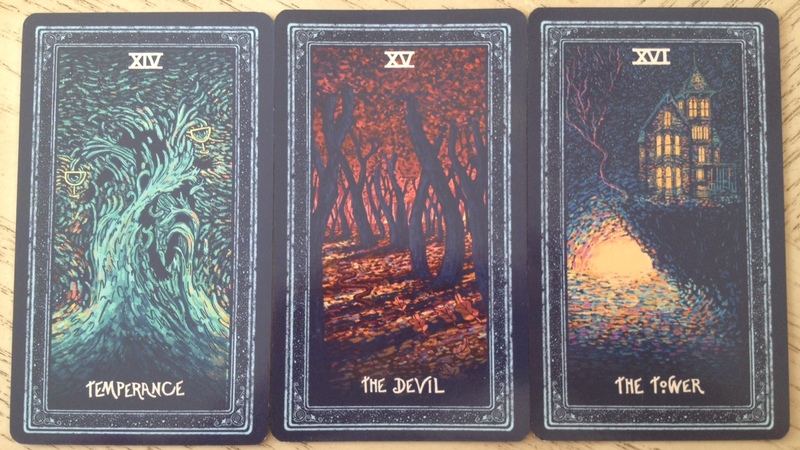 Take on the Devil card – very subtle; one of my favourite cards in the deck, as is the Hierophant. Suit of Pentacles (what a stunning Queen!) with its warm tones; definitely a win for me. I appreciate the dimensions that Eads’ court cards add to a reading, especially the wands, though I agree that these aren’t for everyone! 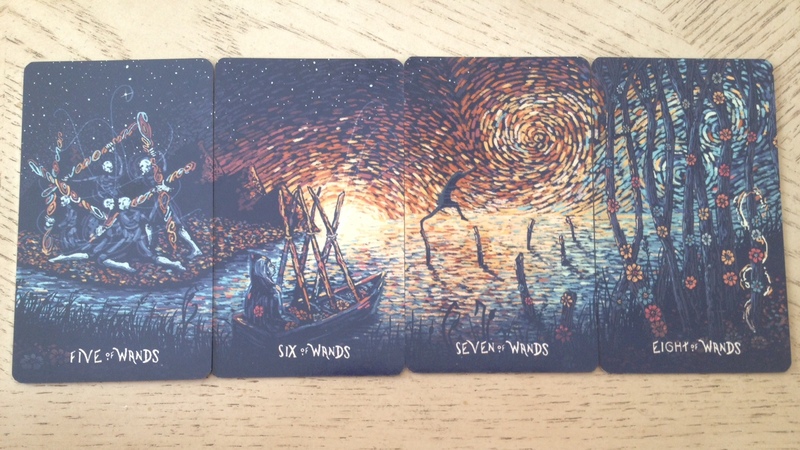 I feel as though I’d read with this deck in relation to a client’s career, or creative ventures. My Prisma Visions Tarot Deck just arrived! OMG, Loving it. I’m getting to know it and asking about our relationship. When I close my eyes, I always get a deep purple lavender eye with what seems like long eyelashes flash brighter and brighter … strangely enough, when I saw the eye on the back of the cards, it was the same! Hope you enjoy! And what a cool synchronicity story! I do love the artwork on this deck so very much!